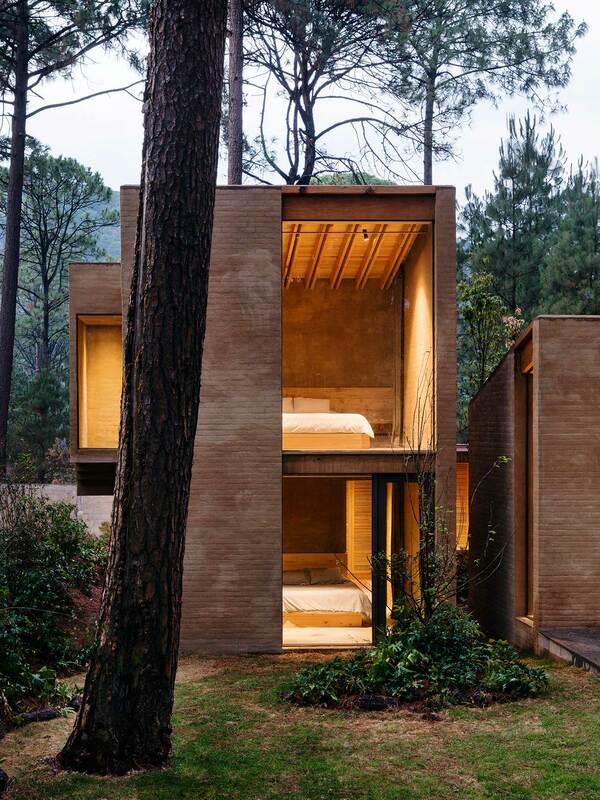 Nestled deep in the pine forest on the hills above the lakeside community of Valle de Bravo two hours from Mexico City, “Entre Pinos” or “Between the pine trees”, is a group of five vacation houses harmoniously integrated into the natural landscape. 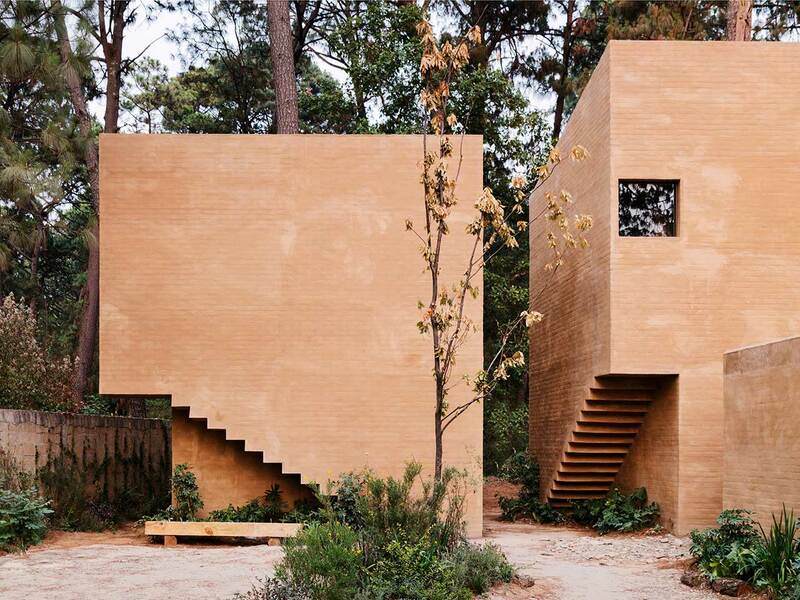 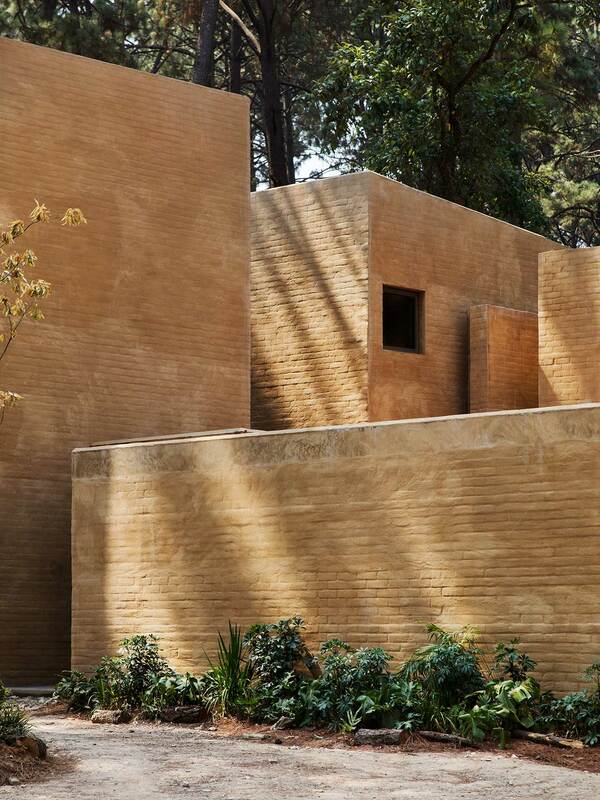 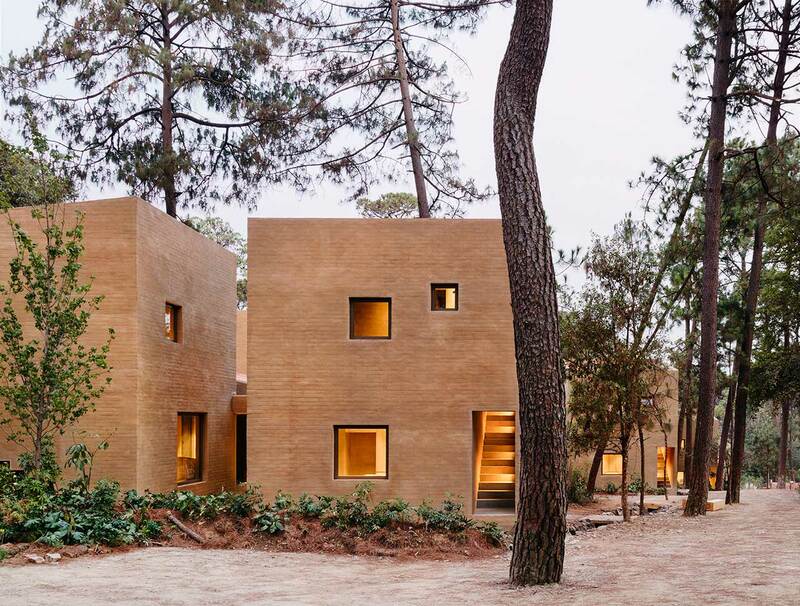 Designed by Mexican architects Taller Hector Barroso, the residences are built out of local materials and have been shaped into a seemingly abstract yet thoughtfully composed cluster of terracotta blocks that seem to have sprung organically out of the earth. 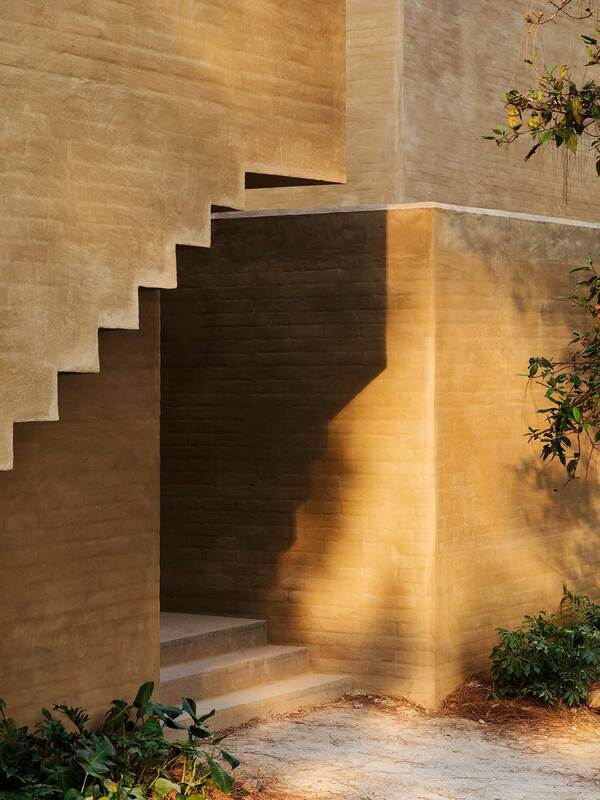 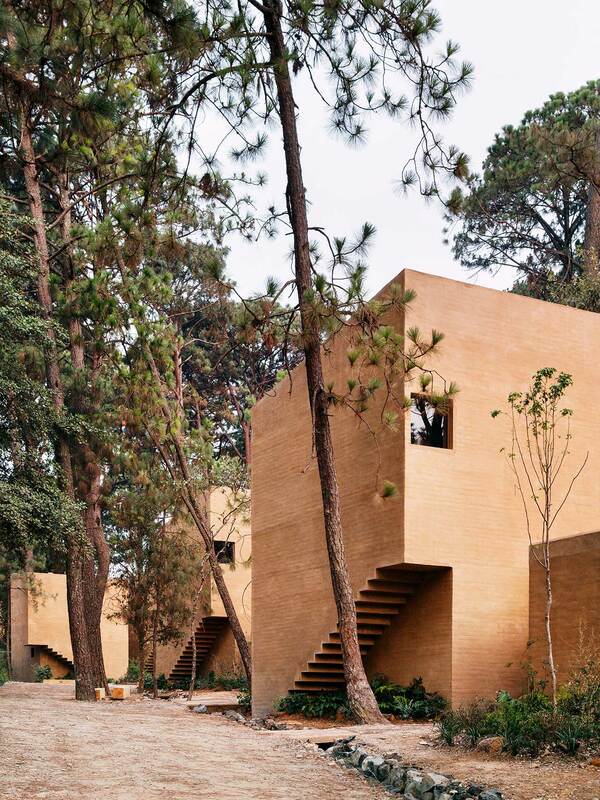 Built in a row that gradually ascends the site’s sloping topography, the 340 square metre houses are identical in layout and form, each one comprising six monolithic one or two-storey blocks arranged around a central patio. 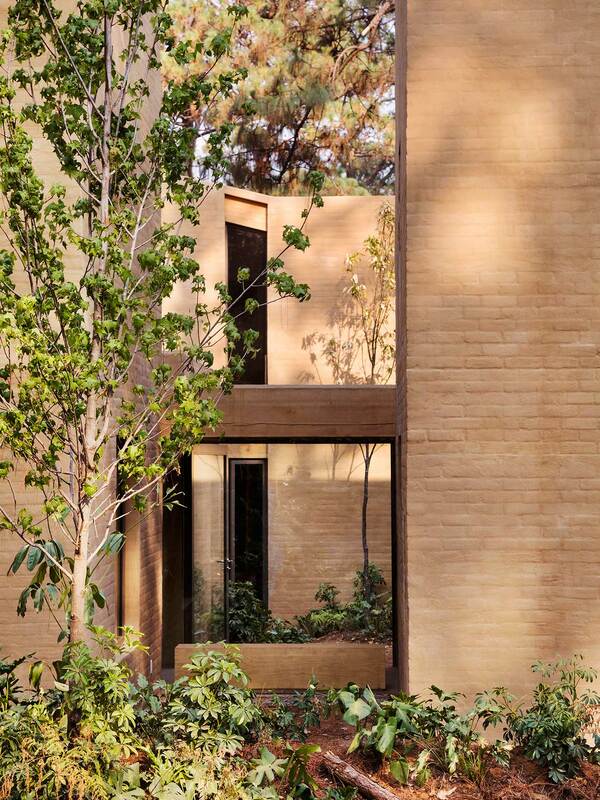 The houses turn their back to the access dirt road in the north, both to ensure privacy and minimize heat loss. 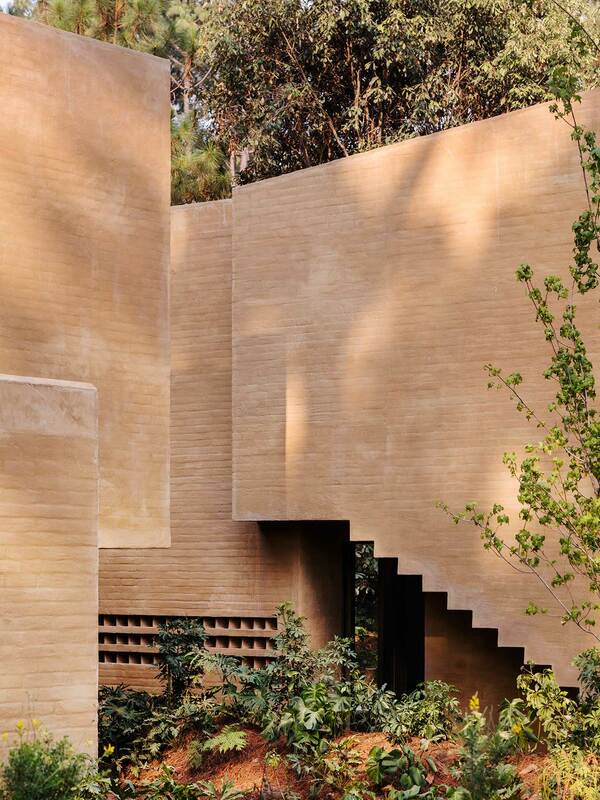 The only distinguishing characteristic of the solid, windowless cubic volumes that is visible as you approach them from the north are the jagged, triangular voids formed by the underside of the extruded staircases. 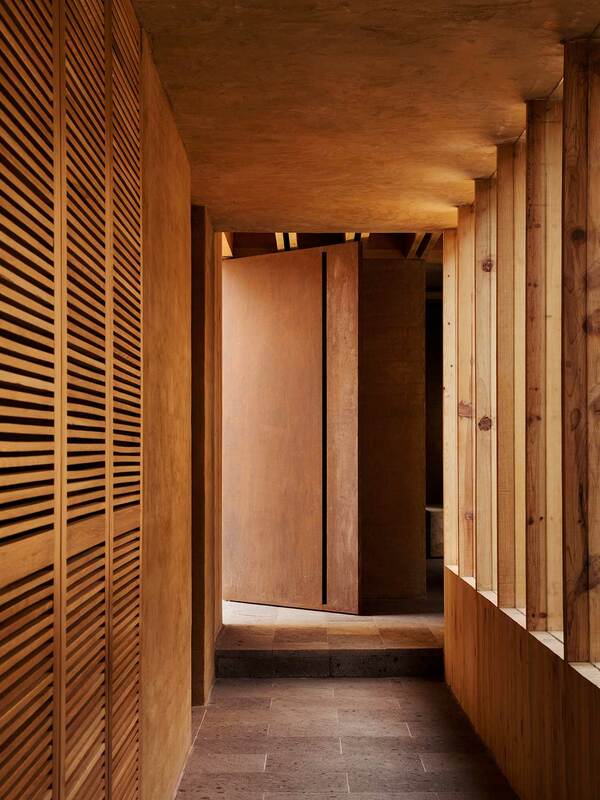 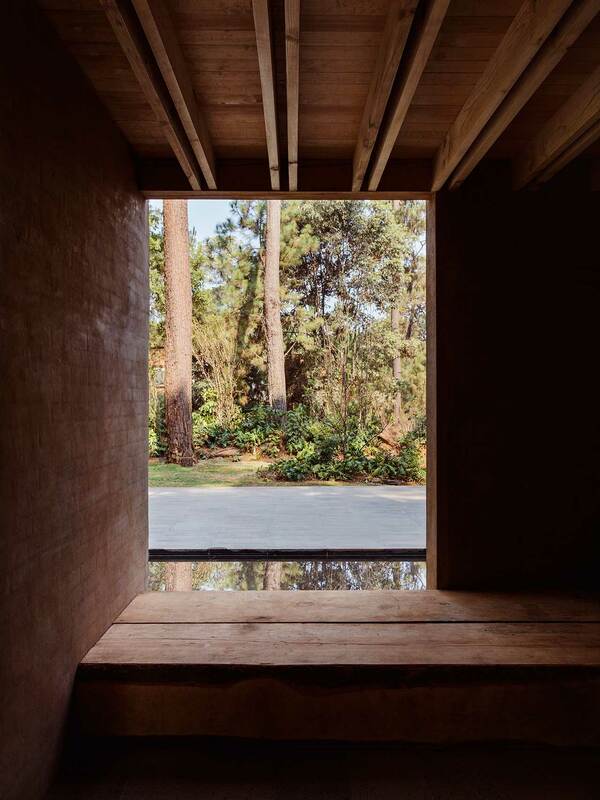 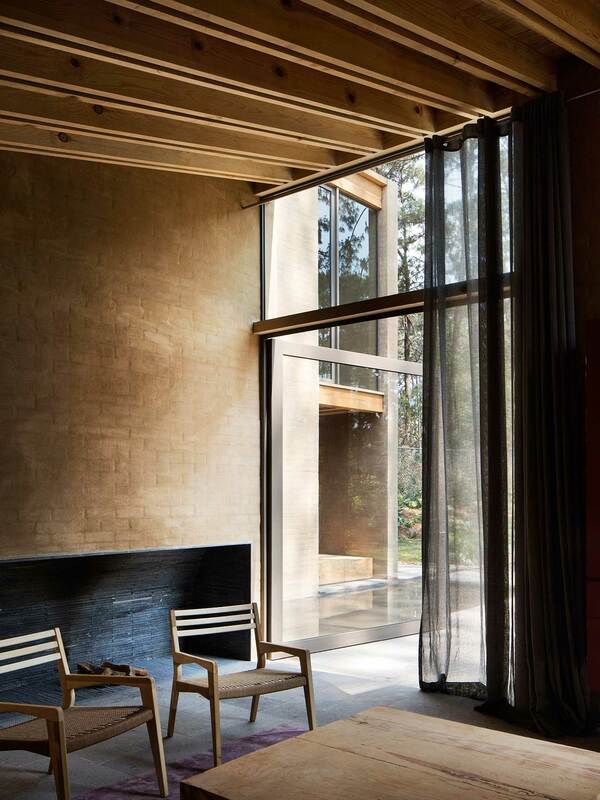 Conversely, full height windows and glazed doors on the south-facing façades offer stunning views of the forest while allowing the rooms to be generously illuminated during the day. 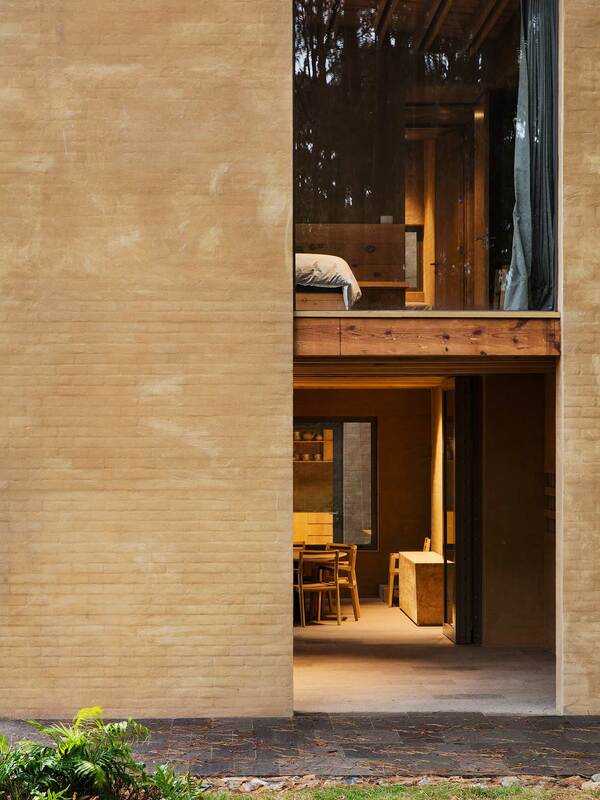 Occupying the ground floor, the communal spaces are clustered around a central terrace on the back that the living and dining rooms open onto. 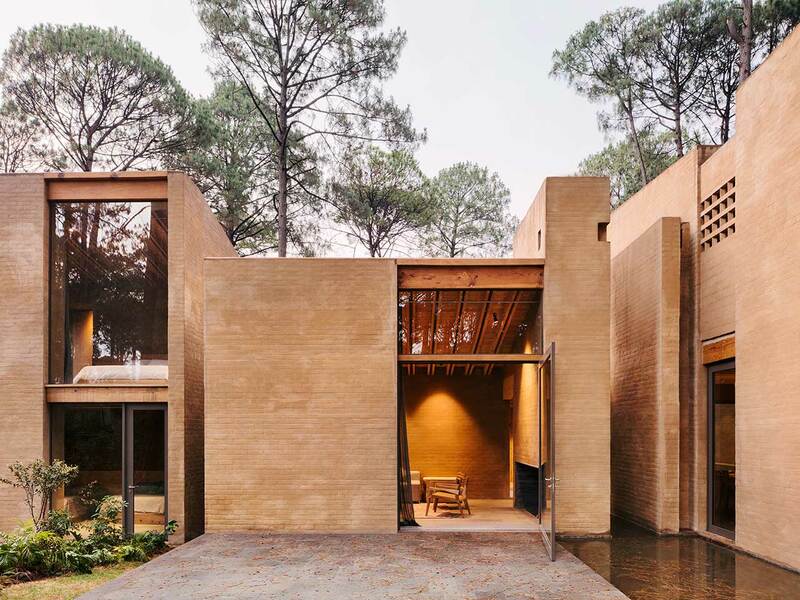 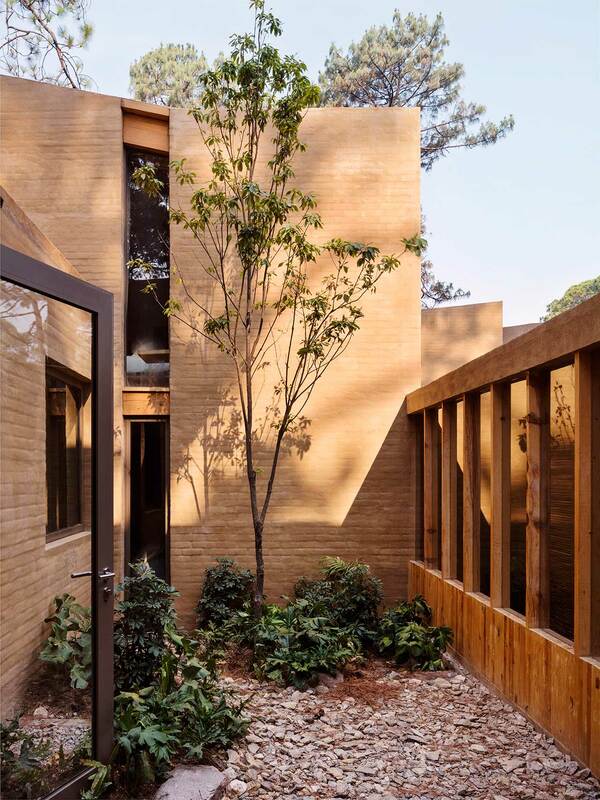 The terrace, along with a reflecting pool and a landscaped garden, acts as an intermediary zone between the interior spaces and the forest while the staggered position of the residences safeguards the occupants’ privacy and forges stronger ties with nature. 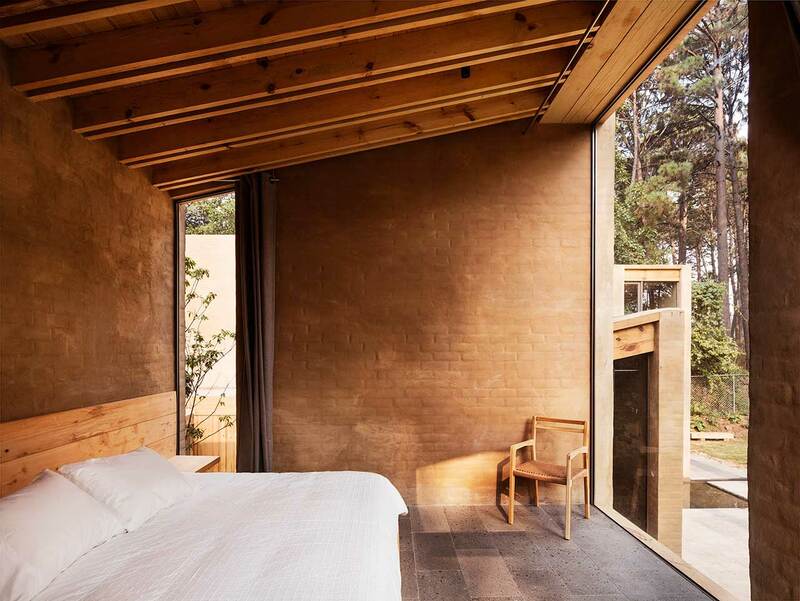 On the upper floor, three bedrooms with en-suite bathrooms enjoy sweeping views of the majestic pines while a fourth bedroom occupies a separate block on the ground level. 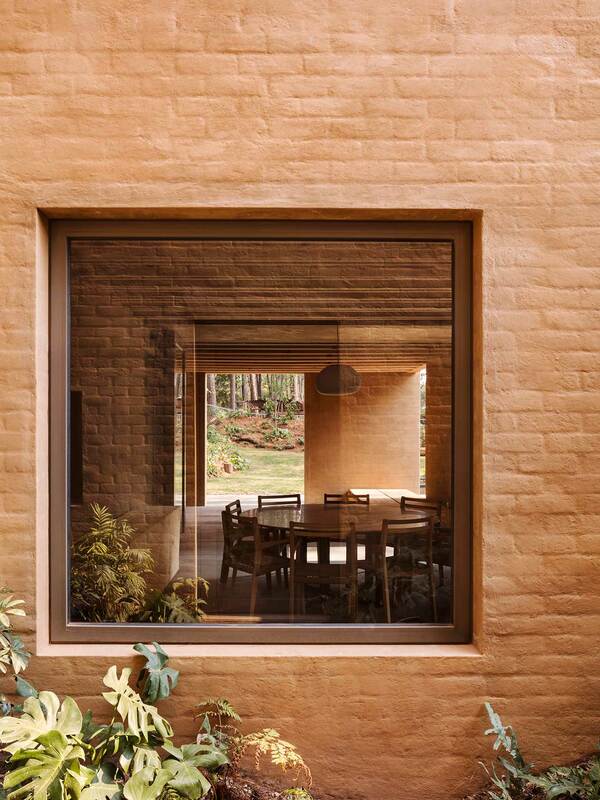 Apart from providing far-reaching views of the forest, the south-facing glazing also allows solar penetration that during the winter provides passive heating, part of a comprehensive sustainable design that also includes the use of thermal mass for cooling and heating, and the sourcing of local materials, namely bricks, wood and soil. 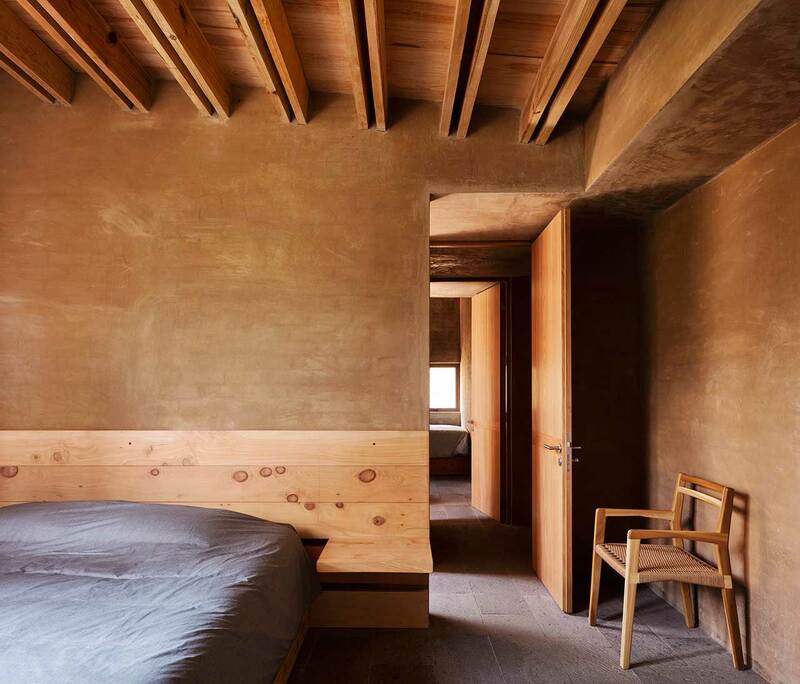 The latter was extracted in situ during the excavation and was used to coat the exterior lending the buildings an earthy terracotta hue. 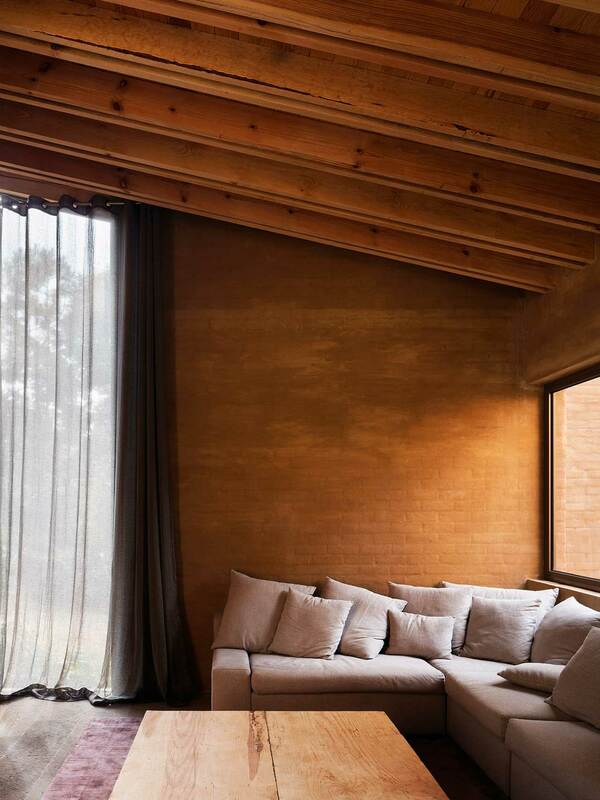 The same warm tone also dominates the interiors where the exposed brick walls are perfectly complemented by the natural stone flooring, the exposed timber framework and the wooden built-in furnishings that range from cupboards and wardrobes, to benches, counters and headboards. 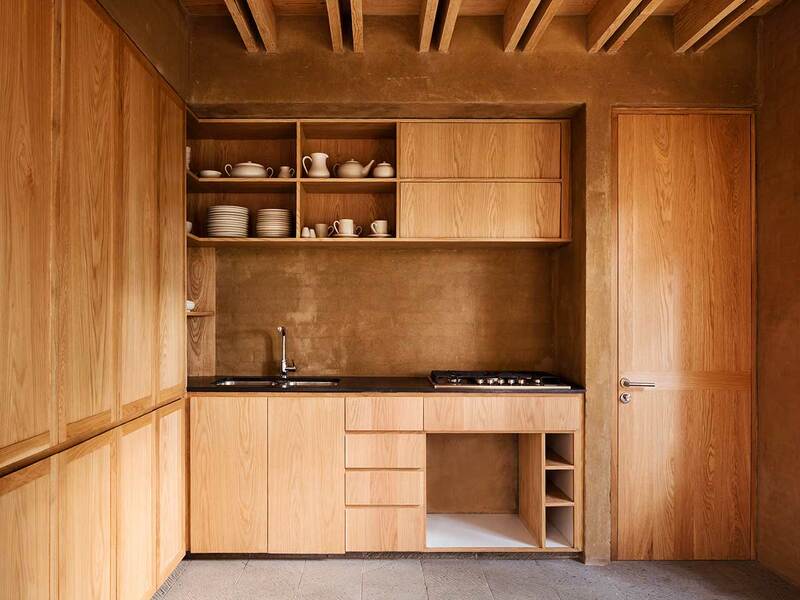 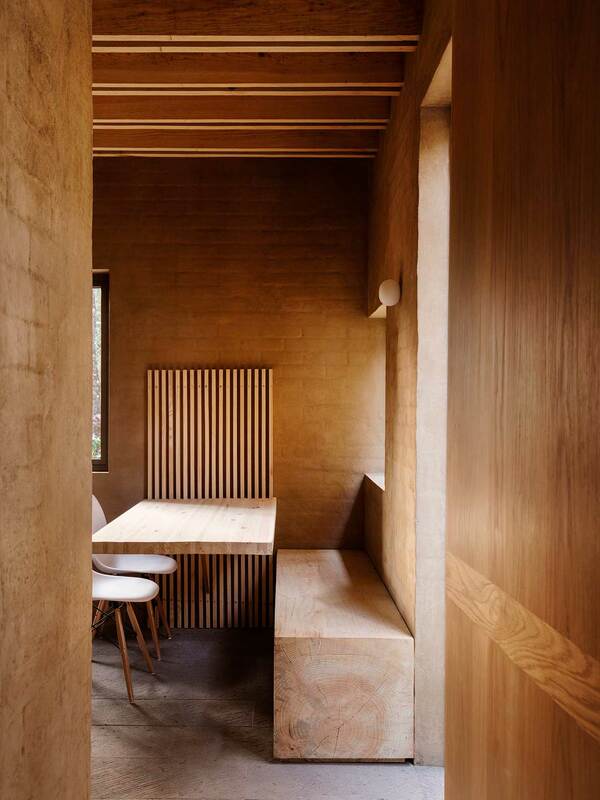 All in all, the minimalist interior décor and the homogeneity of the earthy hues bestow a soothing consistency that gently balances the deconstructive composition of the building blocks and harmoniously integrates their rectilinear geometry into the natural scenery.